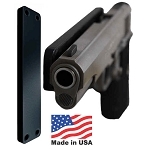 The Pistol Magnet & The Mag Mount are a revolutionary gun mount for those with concealed carry allowing you to quick draw for fast, easy retrieval of handguns, rifles and magazines. 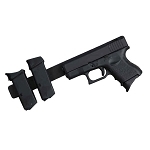 Designed to be easily mounted anywhere in your home, office, or vehicle to safely hold your handgun or magazines. Police tested, great for both men and women, and won't scratch your firearms.